After the military draft deferment ended in July 1943, over 2,500 college students entered the Army Special Cadet Officer Pilot training program beginning October 1. A total of 316 pilots died in kamikaze attacks from the 1st, 2nd, and 3rd classes of the Army Special Cadet Officer Pilot Training Program . In 1943, when World War II reached a turning point, Japan's war situation suddenly worsened, and the whole war situation turned critical. That year in October, more than 2,500 young men gave up their college studies and faced the crisis as Army Special Cadet Officer Pilots. The 2nd, 3rd, and 4th classes followed this first group. These student eagles who exchanged their pens for aircraft control sticks overcame their doubts, broke off attachments with relatives and friends, and earnestly stove for their nation's glory and for world peace. They sought life in death. Due to the grave situation, they carried out rigorous training day and night. These student eagles flew over the faraway continent and equator, and many fellow pilots were shot down in air battles. Furthermore, they died protecting Okinawa as the main force who carried out special attacks. Their anonymous honor is engraved in history, and there is no end to our grief and sadness. Peace was established by their blood and tears. We dearly love our country and hope for peace. Here we tell future generations of the role played by the Army Special Cadet Officer Pilots along with honoring our brothers and consoling their spirits. The front of the monument shows a standing pilot, one large single-engine plane, and four smaller twin-engine planes. The back of the monument lists 905 names of Army Special Cadet Officer Pilots who died in battle. Ryōzen Gokoku Jinja is a shrine dedicated to those who died to protect the country. 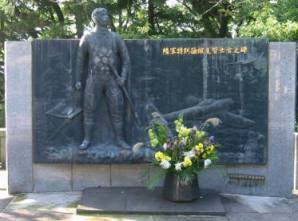 This jinja has several other monuments dedicated to those who died in wars, including the Hakuō Memorial Monument erected to honor Navy Flight Reserve Students who died during World War II. The Navy's Flight Reserve Students and the Army's Special Cadet Officer Pilots both came from universities, high schools, and technical schools under the educational system existing at the time. Most other prefectures also have a gokoku jinja to honor those from the prefecture who died in wars to protect the country.